Give your plush a fresh, clean, stain-free reboot with the guidance here. But keep in mind, it will be permanent, so be sure you can commit before you proceed. Carpet is a costly investment that should last at least 10 years, but discoloration—thanks to spills, pet mishaps, and lots of sun exposure—can make it look old before its time. Rather than replace that pricey plush, consider this crafty alternative: a dye job. Recoloring your carpeting with professional-quality carpet dye (not fabric dye) can affordably and effectively cover up the sins of the past. And, lucky for handy homeowners everywhere, the color-fast and fade-deterrent DIY supply comes in virtually every color. The market offers carpet dye in some 70 colors, and with powdered dyes, color depth can be adjusted by mixing with either more or less water. Shop for it at home centers, carpeting stores, or online (try the AmericaColor Dyes & Chemicals shop) and read on for how to dye carpet to achieve dream flooring. Note: Before you commit, keep in mind that this process cannot convert dark carpeting to a lighter shade, and the color on the package may not be quite the color you get, depending on your original carpet shade and type of any stains. To get an idea of the final result, test on a small, inconspicuous area, such as where a couch or other large piece of furniture will be replaced. • Wool is naturally fire-resistant, so it will burn slowly, smell vaguely like burning hair, and leave ashes. • Nylon will melt under fire, creating a plastic-like bead as it curls up and solidifies. If your test proves inconclusive, cut a one-inch square from an inconspicuous corner and take it to a carpet showroom for a professional opinion. Prepare the room by clearing out every piece of furniture. Then, remove all baseboard molding using a claw hammer or pry bar. Take care not to damage baseboards if you intend to reuse them (you may even wish to give them a fresh coat of paint). For a truly updated room, install new baseboards when the carpet is dyed. While you don’t need to remove the baseboards, it’s recommended. Doing so will ensure the dye job extends all the way to the wall (as opposed to leaving the edges along the baseboards a slightly lighter shade of dye). Plus, re-installing baseboards after the job might cover any color bleeding along the bottom of the wall. • For wool carpets, which are “washed” rather than steam-cleaned, engage a pro who’ll have the right chemicals and processes for the job. 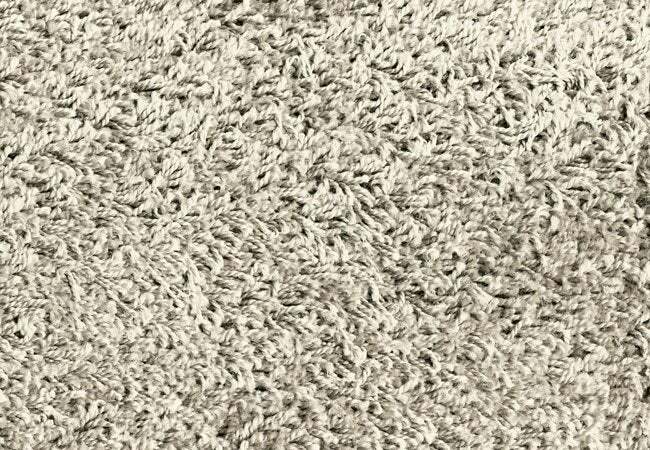 Tip: Tell the cleaners you intend to dye the carpet; they might be able to offer advice and even “stabilize” the carpet for you, allowing you to skip Step 5. Let the carpet dry thoroughly overnight. Protect walls from overspray. Use masking tape to attach newspaper all along the walls, and take particular care to tape the bottoms of the papers so that they won’t prevent any portion of the rug from receiving dye. Correct any alkalinity and pH imbalance issues in your carpet, which might’ve occurred if you’ve steam-cleaned wool in the past or have stains from pet accidents. Since there’s no way to test for such imbalances, it’s best to assume they exist. If you skip this step, you could wind up with uneven results. Purchase a pH stabilizer from the same place you buy the dye, then follow the manufacturer’s directions carefully to prepare and apply it. Be sure to don work gloves and ventilate the room before using. With the windows still open and your work gloves on, spread additional newspaper out beneath the 1-gallon bucket and mix the dye, following manufacturer’s directions carefully. Many carpet dyes are acidic and require mixing with hot water; if so, pour the dye into water that’s between 160 and 180 degrees Fahrenheit and be ready to spray immediately after mixing. Depending on the manufacturer, 20 ounces of powder dye could cover up to 1,000 square feet of carpet. Insert the funnel in the sprayer and carefully pour in the mixed dye. Close the sprayer up, shake it a bit and do a test on an area sure to be covered with furniture later. Try spraying from one to two feet away and gauge the coverage. Adjust position until you get the level of coverage you like. Then use the bristle brush to brush the dye in with a light, semi-circular movement. Once you’re happy with the results and know the best distance to spray from, proceed with the remainder of the room. For the ideal exit route, start spraying in the corner opposite the door. Spray only as much as an arm’s length at a time, because you’ll need to crouch down and rub the dye in with the brush. Once you finish brushing each section, stand back and assess application; if uneven, adjust. Mix more dye as needed throughout the process. Let dry per manufacturer’s suggested drying time, at least 24 hours. When carpet is dry, replace baseboards and furniture—perhaps rearranging the layout while you’re at it to complete the new look! If you really love your carpet’s current color and would only dye it as a last resort to hide stains, consider having it cleaned by a pros with the knowledge and experience to banish years of unsightliness. And if you doubt that your first try at how to dye carpet will produce even results, there’s a professional you can hire to do that, too. However, if you’re feeling up to the DIY challenge and prepared to make a permanent change, dedicate at least half a day for the dying process—once you start spraying, you must finish the job!